The case of twin shaft concrete mixer is mainly made of plates and profile steel. The case is welded in concrete mixer factory and is assembled with other parts of JS II concrete mixer. The case is the brace of twin shaft concrete mixer. The case is tightly sealed, so there is no fly ash and leakage phenomenon. The spiral shaft assembly is the main component of twin shaft concrete mixer. The spiral shaft assembly is mainly composed of left and right rotation screw shafts, bearing seat, bearing holder, bearing cover, gear, sprocket wheel, oil cup, blades and other components and parts. Left and right rotation screw shafts has high manufacturing accuracy, good processing property. There are strict coordinating requirements for left and right rotation screw shafts with bearing seat, bearing holder and bearing cover. Gear and sprocket wheel all have protective cover to protect them and they can be safely and effectively operated. Oil cup is pressure injection oil cup, so it is convenient and effective to add lubricating oil. The blades are made of wear-resistant materials.The blade structure is reasonably and simply designed. So it is easy to replace blades after wearing. At the same time, the blades have long service life. 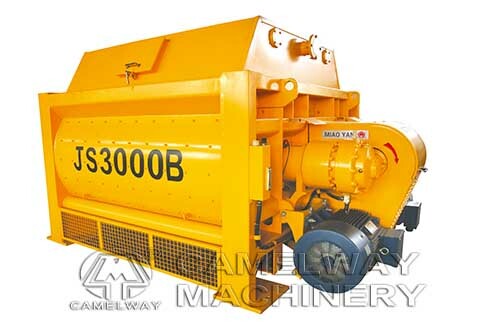 How to Maintain the Concrete Mixer?